The book festival provides an intriguing instance of the overlapping cultural, social and economic dimensions of contemporary literary culture. In this article Dr Beth Driscoll and Professor Claire Squires give a brief introduction to the application of a new conceptual framework, that of game-inspired thinking, to the study of book festivals. The first book festival game we made was a failure — but an interesting one. We designed a ’race game’, from box office to author events to closing night party. Tom Gauld’s recent Guardian cartoon has some similarities to our board, which is further proof if more were needed that great minds think alike. 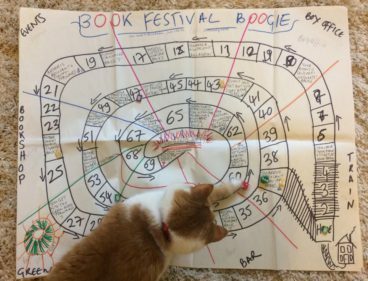 Where our ‘Book Festival Boogie’ differs from Gauld’s game, however, is that we followed the point of view of a reader, not an author. And it turns out this is difficult to do in ways that don’t feel totally oversimplified — people’s reasons for being in the audience of festivals are too varied and subtle. Readers can’t easily be put into boxes (nor can cats). Book festivals, on the other hand, are regularly put into boxes by funding bodies, the media, and the literary world at large. Our second game, ‘Book Festival Top Trumps’, plays with this idea. Each card ‘scores’ book festivals against a range of criteria: attendance, prestige, programming, Twitter presence and the charming (but ultimately still measurable) ‘Unique Selling Point’. So, for example, Bloody Scotland has its writers’ football match; Wigtown has lobsters in the green room; and the virtual #ScotLitFest can be attended in your pyjamas. This game models the way in which festivals are sometimes pitted against each other. 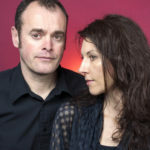 It allows players to take on the point of view of festival organisers, who must justify and promote their festival to a range of different stakeholders. Our most engaging and complicated game, one which stretches the metaphor most fully, is ‘Bookfestivalopoly’. 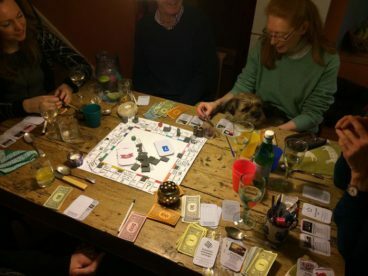 This game is played from the perspective of the author, who must try and earn speaking fees and ‘critical acclaim’ points by landing on festivals arranged around the board, Monopoly style. Part of the satirical play of this game is realising that there is a hierarchy of festivals, from obscure niche genre festivals in small European countries through to the marquee events of Edinburgh and Hay (the Mayfair and Park Lane equivalents). We decided to highlight the bias of such hierarchies by putting Scottish festivals (Bloody Scotland, #ScotLitFest and Ullapool) near the top. (Australian events – the Byron Bay, Melbourne and Sydney Writers Festivals – ranked pretty highly too). Our games aren’t designed to be commercially produced; instead, they are thinking tools created as part of our research. We recently published an article ‘Serious Fun: Gaming the Book Festival’ in the academic journal Memoires du Livre/Studies in Book Culture detailing our project. 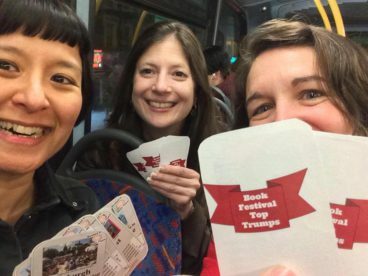 Thinking about book festivals as games is a way to enjoy their many, overlapping dimensions: as places where you can encounter authors and books, meet friends, be a tourist, support publishing, and vanquish rivals (whoever they may be!). Time to roll the dice. Dr Beth Driscoll is Senior Lecturer in Publishing and Communications and Program Coordinator for the Master of Arts and Cultural Management at the University of Melbourne. Claire Squires is Professor of Publishing Studies at the University of Stirling. Further details of their work can be found at https://ullapoolism.wordpress.com/.